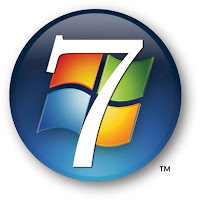 This evening I upgraded the OS on my computer from Windows Vista to Windows 7 - it was quite a lengthy upgrade. I started at about 6.30 and as I write this (11.45pm) it is still finishing off re-installing software that it removed throughout the upgrade process. I had to cancel the upgrade to manually remove the Google Toolbar and McAfee Security - it could not handle this. Later in the installation I had to cancel again because it wanted me to remove iTunes - I guess this is Microsoft's way of saying "Up Yours" to Apple and Google! Each Re-start was manual and I had to start to Upgrade all over again, as well as manually removing each program. Each of the seven programs that were uninstalled (with the exception of iTunes) was re-installed automatically - though user intervention was required. Several re-installs required that the computer be restarted, but I chose not to do this in case things were lots on re-start. At least while the upgrade is taking place I can still work on the computer. I have already noticed some differences in appearance, but the one thing that worked really well is that all my settings are still in place, with user accounts, files, and network connections all working fine. Overall, if it wasn't for the delays encountered with Google, iTunes, and r it would have been a smooth experience.